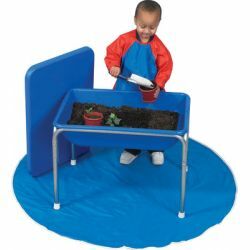 Small Sensory table has white boots, no casters. Tub is made of sturdy, weatherproof plastic with a rust-proof chrome steel frame. Lids sold separately or as a set. 28"l x 20"w x 18"h. Additional shipping charges apply.